I am sure most of you have experienced this! Generally, you will find a good blog also may have at least few drawbacks and you can’t read that comfortably. If the content is great then you will find the design adorable or the navigation not correctly placed. So, it is very important to keep your blog simple and easy to navigate so that user can access and read without any issue. Today I am going to share 5 most important components that make your blog easy and comfortable to read. You will agree to me that this is the first and very important step. Right? Yes the very first thing that comes in blogging is the neat & Clean and pleasant template. The template should be such that it is easy to navigate, color combination should be good and contents should be easy to read. There are thousands of templates online in both Free and Paid for all the platforms (WordPress, Blogger) but you should select as per your use. You can check my detailed guide on selecting Template. You can feel the design and if it is good looking and have basic components then it will provide the best option to read as well. The second most important point is the simplicity. If a blog template is looking great but is having lots of ad-ons or widgets, try to either customize it or avoid that template. You can find many plugins that offer free ads with it and you can make lots of money but these ads are not good for blogs and your readers may distract with the your blog. Try to avoid such plugins. Instead use simple plugins and use only those that are required. 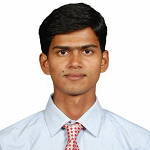 Also, navigation of your blog should be smooth and easy so that user will not have any issue while accessing your blog. Another important point is the font and colour. I have seen many people to use the default style of the CMS and despite of good content people don’t enjoy reading your article. You know the reason behind this? The main thing is the font style, font size and color combination. You should customize the default text style to look it better. Also, font size matters a lot. This helps the readers to read your blog easily and comfortably. It’s well said an Image tells thousands of words. A blog without graphics is unimaginable today and even doesn’t look cool. Today’s online world is full of creativity and if you want to survive in this competitive world you have to be unique. Graphics makes your articles more valuable and also search engines consider these as an extra point and your SERP will increase. So, try to include the required images and Videos in the article to add more values. Suppose you are writing a how to article, you can make a simple video on that as well. By this way you are providing more values to the readers and also you can monetize that video on YouTube to earn some extra bucks. There is hundreds of website from where you can get free graphics or if you know little bit designing then with the help of HTML, CSS and editor you can make for yourself. Do you know blogging tools play a great role in the success? Like to engage your readers more you can use recommended posts features. Similarly, for collecting email ids of your readers you can use Hello Bar etc. These tools and plugins are very easy to use and help you a lot. The next thing is blog like pro. Whatever you are writing or selling do like in convincing manner so that you can make a trust on your readers. By this way you can make more readers and money also. 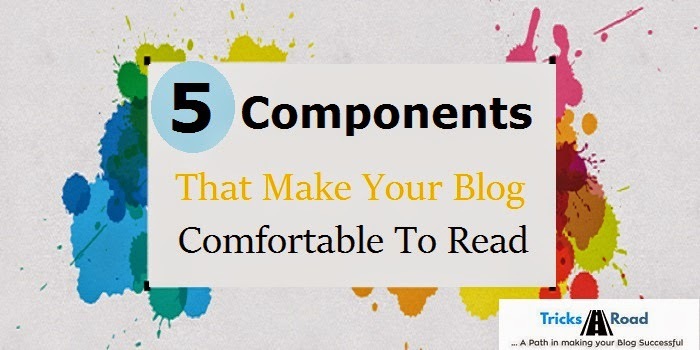 Those were the top 5 components that make your blog comfortable to read. I am sure if you will apply these tips, you will be able to get the best and your blog will improve day by day. What tricks you are using to make your blog comfortable for readers?